New Homes starting at $119,990. This new home community features Town Homes ranging from 1251 sq.ft. up to 1882 sq.ft. starting at $119,990 and single family homes ranging from 1363 sq.ft. up to 1773 sq.ft. starting at $157,990. Quick Move-in Homes Available! Floor plans up to 3024sq.ft. starting at $199,990. This charming neighborhood is closely situated to shopping and dining, making a night of entertainment for everyone easy, fun and convenient. The community features five floor plans from 1,779 to 3,024 square feet. 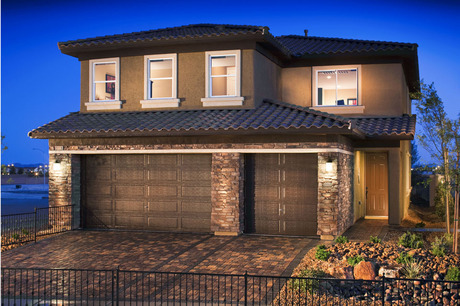 North Las Vegas New Homes starting at $323,950. This new home community offers 3 open floor plans ranging from 1852 sq.ft. 4 bedroom 3 baths 2 car garage up to 2432 sq.ft. 4 bedroom 2.5 baths 2 car garage.Located in at the southwest corner of Ann Road and Camino al Norte is near established shopping, schools, recreation and offers easy access to Interstate 15 and the 215 Beltway. The newly opened VA Southern Nevada Healthcare System Campus is just a few miles east and Centennial Hills Hospital is approximately six miles west of the community. This new home plans offer main-floor master suites, gourmet kitchens and bonus rooms. Located in the north valley, enjoy easy access to retail, dining, Floyd Lamb State Park, Mt. Charleston, and the 215 Beltway.